Our list includes several champions from the 2017 state meets. 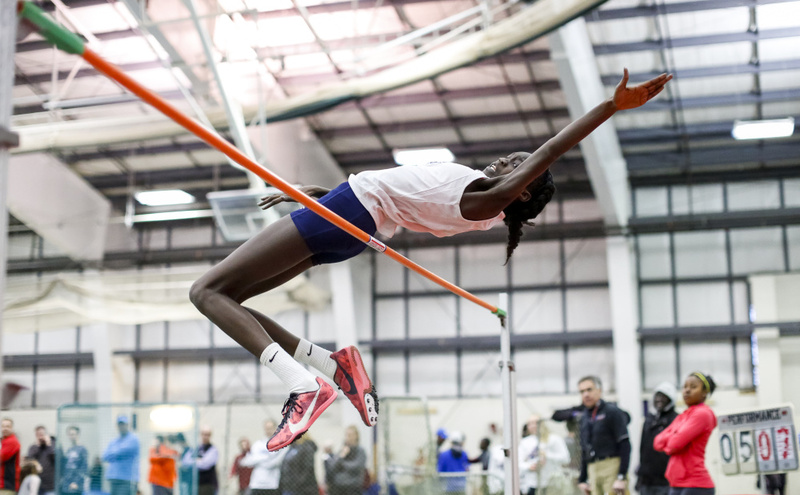 Nyagoa Bayak, Westbrook junior, jumps: Bayak won the high jump (5 feet, 6 inches) and triple jump (37-0.75) at the Class A meet, and finished fifth at the New Englands in the high jump (5-3). Darcy Cochran, Cape Elizabeth sophomore, hurdles/sprints: Cochran won the 55 hurdles at the Class B meet (8.73 seconds) and finished fourth in the 200 meters (27.29). Emma Gallant, Cheverus sophomore, sprints: Gallant was first at the Class A meet in the 200 (26.48) and 400 (58.86), both in state-leading times, and was third in the 55 (7.48). Emily Labbe, Scarborough sophomore, sprints/hurdles: Labbe won the 55 (7.47) and finished second in the 200 (26.98) and 55 hurdles (8.79) at the Class A meet, scoring 26 points. Anneka Murrin, Yarmouth senior, distance: Murrin was second in the mile at the Class B meet (5:13.24) and third in the 800 (2:24.61). She is the top returnee in Class B in both events. Malaika Pasch, Falmouth junior, distance: Pasch was the top miler at the Class A state meet (5:24.12) and finished third in the 800 (2:20.17). Juliana Selser, South Portland senior, distance: Selser won the 800 at the Class A meet in a state-record time (2:16.82), and took fourth at the New Englands in the 1,000 (2:53.72). Mia Taranko, Thornton Academy sophomore, jumps: Taranko won the long jump at the Class A meet (17-3.25) and placed seventh in the triple jump (33-4.25). Carolyn Todd, Greely junior, distance: Todd was fourth in the 2-mile at the Class B meet (11:55.06) and in the mile (5:29.80). She is the top returning 2-miler in Class B.
Emma White, Cheverus junior, jumps: White placed second at the Class A meet in the long jump (17-2.25) and triple jump (36-5.5). She was third in the long jump at the New Englands (18-1). Samuel Cenescar, Brunswick sophomore, jumps: Cenescar was second in the high jump at the Class A meet (5 feet, 10 inches) and is the top returning athlete in the event. Longhao Chen, Thornton Academy senior, jumps: Chen placed second in the long jump at the Class A meet (21-0) after improving by over a foot on his fourth-place finish at the Southwesterns (19-9.25). Matthew Concannon, Cape Elizabeth senior, sprints: Concannon was second in the 55 at the Class B meet (6.84) and is the top returning athlete in the event in Class B.
Dominic Creenan, Westbrook senior, hurdles/jumps: Creenan won the long jump at the Class A meet (21-6.75) and took third in the 55 hurdles (7.99). He is the top returning long jumper in Class A.
Jarett Flaker, Scarborough sophomore, sprints: Flaker was first in the 55 (6.68) and second in the 200 (22.99) at the Class A meet. He ran a state-leading time of 6.61 in the 55 earlier in the season. Luke Laverdiere, Yarmouth senior, distance: Laverdiere won the mile (4:24.35) and 2-mile (9:49.73) at the Class B state meet, and finished fifth in the mile at the New Englands (4:19.04). Jason Montano, Thornton Academy junior, throws: Montano came in second in the shot put (51-10) at the Class A meet and finished fourth at the New Englands (50-9.5). Travis Snyder, Thornton Academy junior, jumps/hurdles: Synder was third in the pole vault (14-6) at the Class A meet and is the top returning athlete in the event. Conner Piers, Falmouth senior, distance: The top returning 2-miler in the state in Class A, Piers finished second in the event at the Class A meet last year (9:55.97). Zach Westman, York senior, jumps/hurdles: Westman placed third in the triple jump (40-5) and the 55 hurdles (8.49) at the Class B meet, and is the top returning triple jumper in Class B.